According to the US Army’s 2030 vision paper, by 2030 60% of the world’s population will be living in cities. This is a drastic change to how the armed forces must operate both tactically and logistically. Battles will be fought in close quarters, in vertical locations, and with potential logistical issues. The battle will be fought within city blocks with both horizontal and vertical elements. This impacts a variety of elements including ammunition and resupply. With the potential for an engagement to be fought on multiple axis, war fighters will find themselves in need of ammunition resupply in locations that may not be conducive to transportation. To counter this problem of close quarters and vertical resupply, CR&D has developed a new type of ammunition that can be built using raw materials harvested from the surrounding environment and combined with fast curing polymers that allow the warfighter to create thousands of bullets. Warfighters normally carry a maximum of 800 bullets. 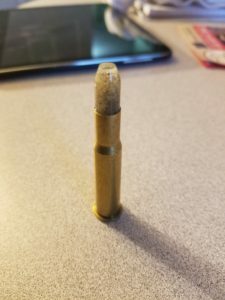 These same bullets can be repurposed to become thousands by using materials such as sand, concrete, metal as mass in polymer-infused slugs which can be rapidly manufactured in-situ using spent casings. This rapid manufacturing can be done at the Forward Operating Base or where the warfighters are situated.